On the old roman road between St. Albans and Wheathampstead you'll find the village of Sandridge. It was first recorded as Saundruage and has a population of around 5,000 people. The oldest building in the village is St Leonards Church which dates back to 1114. Sandridge was of national importance during the Second World war due to the presence of a secret station for intercepting wireless enemy transmissions which were then relayed to Bletchley for decryption. To the north of the village is Heartwood Forest which, I'm told, takes its name from the heart-shaped leaves of the Lime trees that grow here. Unusually, with the exception of a few patches of ancient woodland, this one is brand new. In 2008 the Woodland Trust acquired 850 acres of arable farmland from Hillend Farm in order to embark on its most ambitious project to date. In 2009 the trust began planting the first of what will be a total of around 600,000 trees by the time the planting is complete sometime in 2018. The project does not only involve planting the forest trees, but also creating new wildlife habitats such as wildflower meadows, grassland and even wetlands. Thousands of local people have been involved in the project which also includes a six-hundred-fruit-tree orchard. An arboretum has also been created and this is the only one in the UK to contain all of our 57 native tree species. On 29 July 2017 the forest became home to Heartwood Forest parkrun, and I visited to take part in event 6 which was held on 9 September 2017. Usually at a venue like this, I would park in the on-site car park. However, although there is a car park within the grounds, it is not currently available for those wishing to take part in the parkrun. Being a new event, overwhelming the car park might upset some of the regular Saturday morning users of the forest (dog walkers, of which there are many) and that wouldn't be a good way to begin. With that in mind, I had to find a place to park outside the forest grounds. Somewhere in the village was the obvious choice so I popped the car into the free car park at the village hall. Conveniently the toilets are also located here so I made use of them before heading over to the forest which, for the record, currently has no further facilities apart from a bicycle rack. The nearest train station is about 3 miles away in St Albans. Once within the woodland trust grounds I found the parkrun volunteer team just next to the forbidden car park. One of the first things that I noticed was the venue feels more like a country park rather than a forest because the thousands of saplings are still only around a metre or two tall. As 9am approached I had a quick warm-up and before I knew it it was time for the first-timers briefing. With that done and dusted the participants were lead about 400 metres along the gravelly path to the start point which is found right next to the badger bench. In fact you'll see quite a few carved wooden animals as you work your way around the course - they represent the wildlife found here and mark the 'Magical Meander', a trail that leads towards The Magical Wood. They were sponsored by the Disney Store and are the work of chainsaw carver Will Lee. The main briefing was held at the starting point and the runners were then sent on their way. The course is made up of one full lap followed by about three-quarters of a second lap. Underfoot is a combination of a loose gravel paths and off road grass/dirt paths. As far as shoe choice was concerned, road shoes would get you around during the summer months, but I have a strong suspicion that during the winter trail shoes will be a must. So, the course... It starts on the gravel path and instantly heads uphill, it's not steep but it'll put you in your place if you start off too fast. About 200 metres in, the course turns onto grass and continues to head gently uphill. As the course starts to flatten out it joins a bridleway - there is a good chance that you could encounter horse riders along this section. Once at the northernmost point of the course there is a sharp left-hand turn off of the bridleway and the run now heads through The Magical Wood. The grass path through here is a lot of fun as it twists and turns around the newly-planted trees - it truly is magical to run through and I'm guessing will only get even better as the trees mature. When exiting The Magical Wood the runners pass through the chainsaw carver's beautifully crafted wooden archway and run back along the bridleway - this short section has two-way runners so everyone needs to stick to their respective right-hand-side. Turning off of the bridleway into the open meadow, the south facing view towards Sandridge and beyond is beautiful. The course now gives back what it took during the uphill at the beginning and it's all downhill across the grass and then back onto gravel all the way back to the original meeting point next to the car park. However don't forget to glance to the right on the way down where the magnificent Langley Wood can be seen in the distance - if visiting in the spring it is worth taking a walk into the woods to see the carpet of bluebells which I'm told are simply stunning. Once reaching the car park, it's time to turn left and head back along the path you walked along before the run started. It's a fairly gentle incline averaging between 3% and 6% but it feels like it's never going to end! I had a tiny dog incident along here where a dog walked and stood right in front of me, it broke my stride and I briefly came to a halt - no harm done to me or the dog. The full incline on this second lap covers about a whole kilometre, and once you've retraced your steps through The Magical Wood and back down the gravelly decline, you'll reach the car park but this time you take a sharp right hand turn right into the finishing funnel - job done! After a quick recovery and having my barcode scanned I headed back out onto the course to take a few photos. I had recorded my run using my Garmin and the GPS course data can be viewed on Strava, here: Heartwood Forest parkrun #6. I also used the Relive app to create a fly-by video of the course: Heartwood Forest parkrun course fly-by video. The full results for event 6 were processed and published shortly after the run and 131 people took part. For the record this is a net downhill course (has more downhill than uphill). After chatting to a few of the volunteers after the run, I found out that they are still working on securing some kind of car parking solution, for now it's a choice between the free car park at the village hall or finding a space on one of the residential side streets. However, in all fairness, if you think you'll need to use the facilities before the run and/or plan to hang out with the team at the post-run coffee venue, The Queen's Head pub, the village car park could remain the best option. Lastly, the unique setting of this run means that as the years go on the forest is going to evolve. It's going to be wonderful to watch this happening and I look forward to revisiting in the future to see how things have changed. Update: The Heartwood Forest parkrun organisers have announced that 6 October 2018 will be the last run to be held at this venue. They are looking to find an alternative venue at a nearby location. 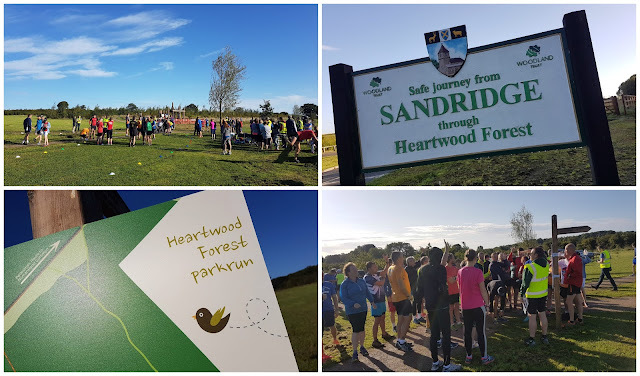 Please see the event's news page article for more information - Heartwood Forest parkrun Closure.